The Source Sport Disc Step Through is pure, unadulterated get-up-and-get-at-it. Built to go fast, its A1 Premium Aluminum frame is lightweight and compliant, allowing you to tackle hills and flats with equal enthusiasm, while its powerful hydraulic disc brakes allow you to brake confidently, every time. With its low-entry frame, which makes getting on and off a breeze, plus integrated racks and fenders, it’ll comfortably power you through the workweek, and then empower you to take on weekend explorations with style. >Durable 700x35mm Specialized Nimbus Reflect tires deliver a stable ride and feature Flak Jacket puncture protection, plus a reflective sidewall for added visibility. >The Women's Riva Sport Saddle was developed to increase blood flow and relieve pressure on soft tissue, ultimately resulting in increased comfort over short and long rides alike. >Turn your Source into a packhorse with the compact, and lightweight Racktime Light-it with Snap-it fender attachment. Keep the goods clean and dry with Specialized aluminum fenders. Specialized A1 Premium Aluminum, step through, fully-manipulated tubing, integrated headset, disc mount, fender/rack mounts, kickstand mount, Rollerbrake mounting points. Alloy legs/crown, Cr-Mo steerer, internal light cable routing, fender/rack mounts. 1-1/8" sealed Cr-Mo bearings integrated w/ headset, 15mm alloy cone spacer. 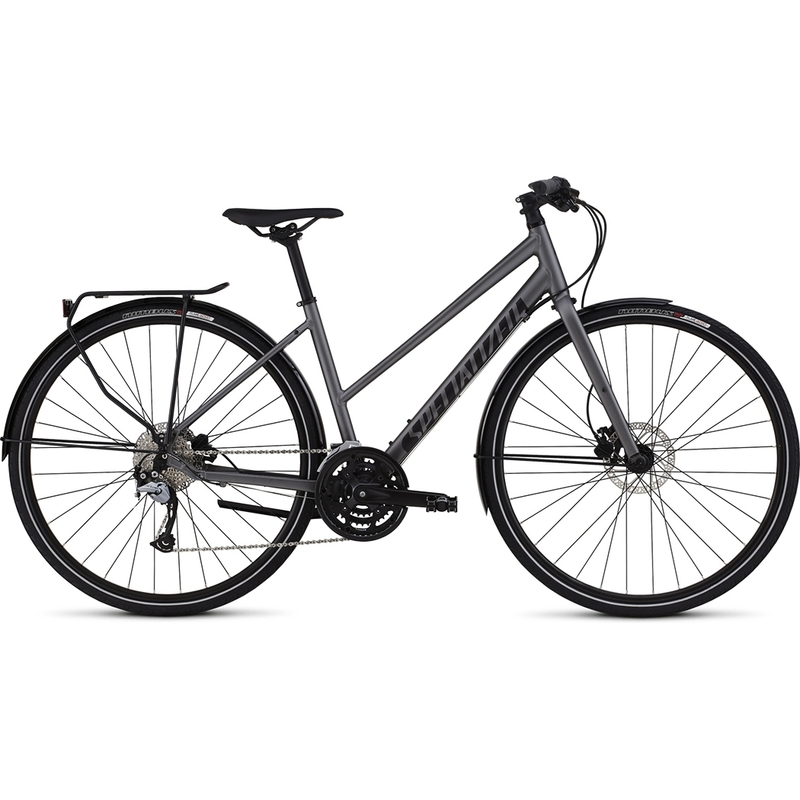 Specialized, 3D forged alloy, 4-bolt, 7-degree rise. Specialized, flat bar, double-butted 6061 alloy, 9-degree backsweep, 31.8mm. Specialized Body Geometry Contour Women's, lock-on, closed end. Tektro Auriga, hydraulic disc, resin/metallic pads, 160mm rotor. Tektro Auriga, hydraulic, reach adjust. Shimano FD-T3000, top swing, dual pull. Shimano Acera RapidFire Plus, SL type, 9-speed, w/ optical display. KMC X9, 9-speed, w/ reusable MissingLink. Specialized Stout, forged alloy, 48/36/26T, w/ chainguard. Nylon body, alloy cage, low profile bearing system. Specialized Stout, Hi Lo disc, alloy, double-sealed, ground race, QR, 32h. Specialized Stout, Hi Lo disc, alloy, double-sealed, loose ball bearings, QR, 32h. Specialized Nimbus, Flak Jacket protection, reflective, 700x35mm. Body Geometry Women's Riva Sport, steel rails, 155mm. Alloy, 2-bolt, micro-adjust, 12.5mm offset, 27.2mm. Custom Racktime Light-it, w/ Snap-in. Specialized, aluminum, w/ anodized struts. Mini Bell, aluminum, w/ pivoted lever.